Hello, I’m Rhon Van Erman, thanks for stopping by my blog. Bio’s are a bit odd for me. I want this to come straight from me and not be a lot of hype and bull created by someone else. I have created this site to track the experiences of the recording of my next CD but I will give you a little backround into my start with music. I have had music in my soul from the time I can remember. Piano was my first instrument at age 6. All was going well until my instructor wacked me across the hand with a batton. That ended lessons but I continued on my own until I finally talked my Mom & Dad into buying a guitar for me at age 12. I took lessons from a great musician named Vic Cook from Anderson In. He helped me perform my original songs at age 14 on regional TV and I was hooked. 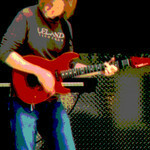 Practicing and writing took me to age 18 when I attended The Southwest Guitar Conservatory in San Antonio Texas. A school started by Jazz great Jackie King, what a great player! From there I went out on the road for ten years and in 1989 wrote a song for Diadem Recording artist Pricilla Engle. My first royalty check, Yes! That’s how Rockin’ Productions was started. I instruct up to 50 students a week in the teaching studio and have a retail instrument storefront. This is where I do what I love, songwrite, teach, and play music. In 1996 I recorded a self titled CD with the song “Page Of Her Heart” that received over 10,000 radio airplays and was a regional success for me. As a recording musician I am tagged by the industry as an A/C Rock Artist for my original music however my upcoming CD will be a shift to a heavier side but with a lot of various styles, thus the title “A/C Rock”. So the experience goes on, as do my accomplishments and continued love and amazement of music. But one of the best things for me is you taking this journey with me!